Italian librettist, composer, poet and critic Arrigo Boito (1842–1918) was an important figure in late 19th-century Italian musical life. He is best known today for his librettos for Verdi’s Otello and Falstaff and Ponchielli’s La Gioconda, and his own opera Mefistofele. 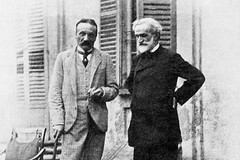 Boito was born in Padua and was raised by his Polish mother in Venice. He studied at the Milan Conservatory, and many early works display his dual talent for words and music. After the initial failure of his Mefistofele at La Scala in 1868 he began to concentrate on his literary career, translating many German Lieder and operas into Italian and writing librettos for numerous Italian operas, including La Gioconda (1876). His collaboration with Verdi began in 1879; in addition to Otello (1887) and Falstaff (1893) he adapted Simon Boccanegra for revival in 1881 and made sketches for Re Lear, though never set by Verdi. In later life Boito also supported a number of young composers. 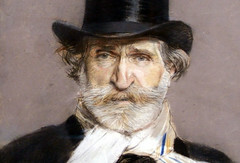 Boito revised Mefistofele substantially for a performance in Bologna in 1875, in which form the work had more success and returned to La Scala in 1881. His second opera, Nerone, was never completed, though it occupied him fitfully for more than sixty years. Six years after his death, a version was performed at La Scala, having been heavily revised by a committee that included Arturo Toscanini.